A cheaper, lighter Surface is in the works according to FCC filings. Microsoft could be preparing to launch a cheaper Surface tablet to compete against Apple's iPad for education according to new electronic device filings with the FCC. Back in May, reports indicated that the company would release new Surface tablets for $400 during the second half of 2018 as a direct response to Apple's latest $329 iPad. According to ZDNet, Microsoft's new Surface devices will have an Intel Core M processor, 4GB of RAM, 64GB of storage and will cost half as much as the high-end Surface Pro. The filings do not describe any differences to any of the existing Surface models which suggests that this is not an updated model but a new tablet entirely that will contain a smaller 24-watt power supply compared to the Surface Pro's 36-watt power supply. The new $400 Surface tablets will likely have 10-inch screens. This puts them at about the same size as Apple's iPad but smaller than the 12-inch Surface Pro. The new devices will also have rounded edges similar to the iPad and will lose the Surface connector in favour of USB-C for charging and data transfer. The Surface's iconic kickstand will still be included in Microsoft's new tablets which will reportedly be 20 per cent lighter. The new Surface tablets will not come with a keyboard cover to keep costs down but there are apparently cheaper versions of the keyboard cover, Surface Pen and Mouse in the works that will launch alongside it. There are also rumours that Microsoft is preparing LTE options for the new devices. 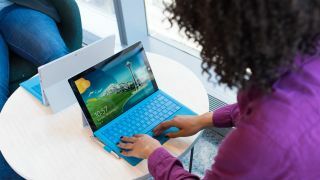 The education market is already crowded with Google's Chromebooks and Apple's iPads but if Microsoft's new Surface is priced accordingly it could find a new audience that is already familiar with Windows.